Any standard lift truck can be converted to lift folded cap cartons by the top with the Basiloid Lift-A-Pliance forklift attachment. Conversion to this system can pay for itself in just months by cutting your handling costs. Product damage from lift truck forks is eliminated. Optional Folding Forks let you use trucks either way. 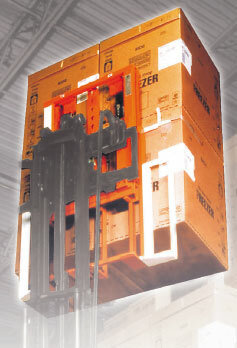 Basiloid Lift-A-Pliance lets you save space above, below and around any high bulk, low density product in cartons. You eliminate the space occupied by pallets which permits narrower aisles because, with top lifting, maneuvering room is substantially reduced. Consider, also the lower initial investment in equipment, storage space and in pallets and you have compelling reasons to switch to the top handling system. Any carton supplier can help you develop an effective folded cap carton designed for your specific product and handling needs. Since every product has a range, these units are custom fitted to your application. Call to develop a plan for your warehouse. We'll help you survey the opportunities.